do you get the Hallmark Channel? if so, there is a new television series i think you should know about: Signed, Sealed, Delivered. in the episode i watched, i got a good feel for the main characters personalities and the dynamics between them. Oliver is the leader and a man of faith, Shane is the new girl who is smart but might sometimes let her emotions get in the way of work, Rita is the humble, hard-working girl-next-door, and Norman is kinda quirky, creative and inventive. they work really well together. it's a wonderful mash-up of romance, comedy and drama, and some exciting tension that left me hanging a little bit. is Oliver a recent divorcee? will Rita gain self-confidence? it all unfolds as they intercept and redirect letters and packages, which leads them to saving lives, solving crimes, and even reuniting old loves. there is prayer, scripture reference, and even Christian music throughout, woven in their conversations and interactions. at times i giggled, i was on the edge of my seat, and at the end of the show, i had tears in my eyes. 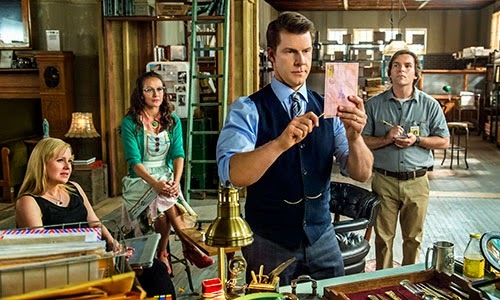 Signed, Sealed, Delivered is a super sweet, family-friendly television show. AND The American Bible Society has built a bible study to go with the series! 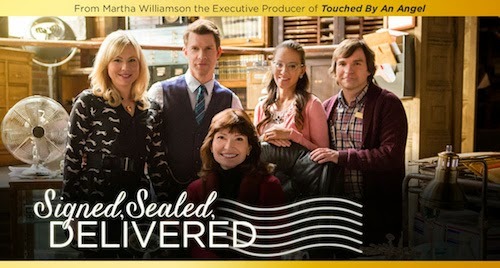 i just signed up to get the free seven-day Bible reading experience to dig deeper into the meaningful biblical themes revealed in each episode of Signed, Sealed, Delivered. click here for the Signed, Sealed, Delivered bible study. Signed, Sealed, Delivered airs Sundays at 8/7 enteral on Hallmark Channel. previously aired episodes are here - check it out!